When they went out with realtors searching for a piece of property, they were not interested in a boring, flat 1/2 acre of land — they wanted something with character and dimension. When they fell in love with a parcel that had a slope, they wisely suspected it would not be easy land to build on. 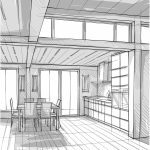 So, before they purchased the land, they found Douglas Cutler Architects on the internet, were very impressed with his home designs and gave him a call to see how he could help. 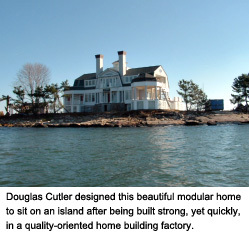 Here is what Doug Cutler had to say about this project. Q. When the customer first called you, did you have concerns about this property? A. I wouldn’t call it a concern. I would say it was a challenge but this is what I love about architecture. Nature provides us with different scenarios, rocks, hills, water tables, wetlands, and so much more. We design for almost every scenario, even islands, and there is always a solution. I want to know as much about my customer as possible, but not only because I need to design them a bathroom that fits their life style. People interest me. I love history and love to talk to my customers about their past and their perspective. Q. Did you advise them on the purchase of this property? A. Yes, they called me before the purchase, which is always smart. We can design for any parcel but because they knew what they wanted, they wanted to be sure that it could happen at that location. Q. Walk us through the process of designing for this piece of land. A. Well, as I said, they called us when they were looking at this property. 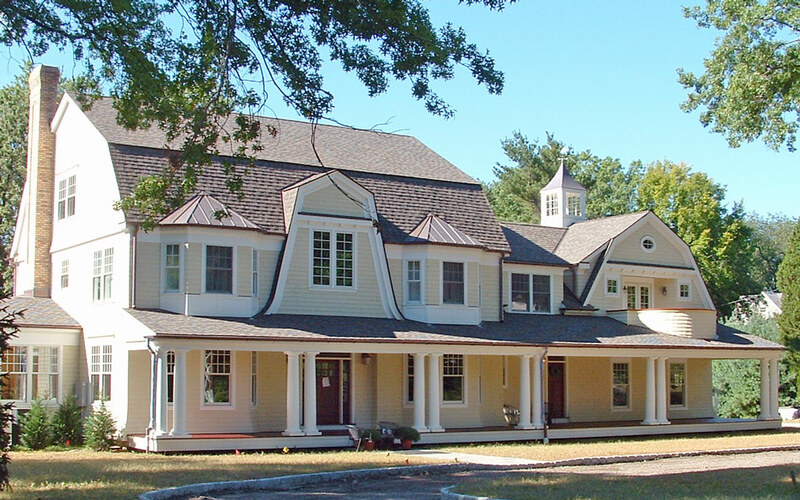 It was .5 acres and had a very steep slope, as much of Scarsdale is built on the side of a ridge. I immediately met them at the site, asked them many questions about their preferences and then did a few sketches with pencil and paper using the trunk of my car as a desk. I love this kind of process because my ideas always come out fresh yet realistic. They were just thumbnail sketches but they were enough for the couple to be able to visualize living on this property. They were very excited to be one step closer to having their dream home. The next step was a feasibility study which included several days worth of my time before they purchased the property. A feasibility study discusses preliminary costs and markets. We charge this at an hourly rate because we do not expect a commitment before we are certain that we can build on that land, but that fee gets rolled into a fixed fee once we have a full understanding of the scope of the project. When we are certain that designing for this land was possible AND a good idea, we advised this couple we could work with this property… and that is just what they did. It was time to get the drawings underway. I invited them to my office to browse magazines and images online. Together, we put together a portfolio of examples they liked and I listened to them discuss the various pros and cons of the images we were looking at. I was getting a very good idea of aesthetic preferences and their family’s lifestyle choices. 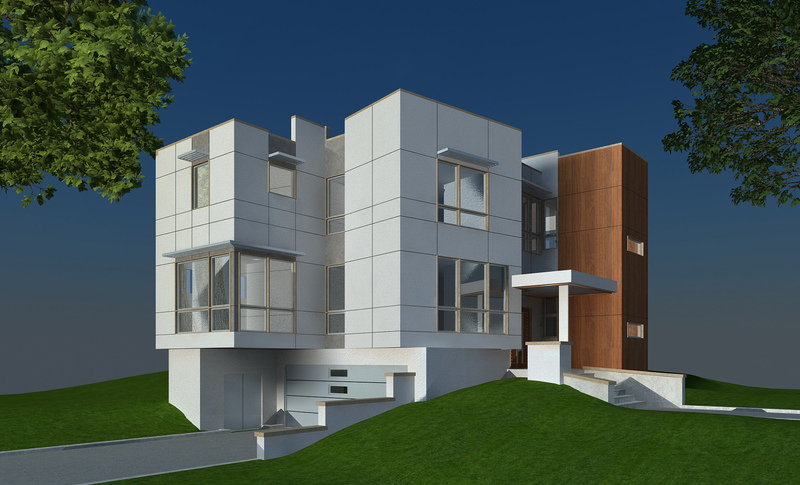 By the time themeeting ended, they had hired us to create the preliminary design of their new home. Q. Tell us more about the challenges of this land. A. This property had many challenges stemming from the fact that the buildable area was constrained by the percentage of grade. This means that the square footage of the perimeter was limited. We had to find another way to get them the space they needed for their family to spread out. Q. What did they see next? A. After a few weeks of working with my team, we showed them our progress, which included two distinct architectural schemes based upon their portfolio ideas, their budget, room counts etc. After another one on one discussion, they chose one of the schemes with a few modifications. They were very enthusiastic upon previewing their first scheme but we still suggested that they take the plan home to sleep on it. They said they were sure, and that they were ready to move forward. It was time for us to create the actual construction drawings. Q. What are construction drawings. A. The construction drawings are the second level of commitment and take several months to complete. They tell the factory what to do and how to do it. 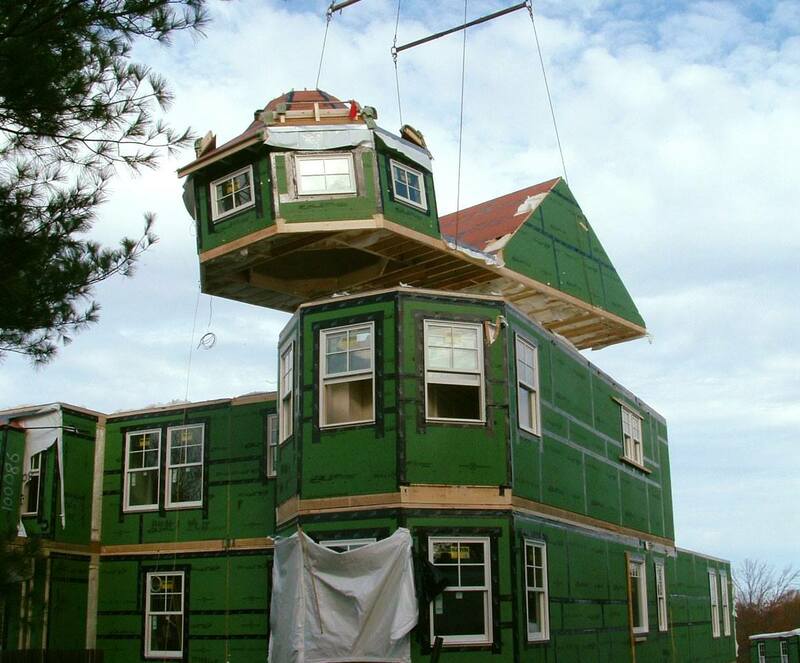 They involve all the elements of the home, rooflines, room size, electricity, plumbing, foundations, heating, cooling, materials, and so much more. There is a drawing for each element which requires approval from engineers and zoning commissions. Q. Give us the bottom line on designing for a piece of challenging land. We found a solution for a complicated property. Their are lots of troubled lots in very upscale neighborhoods that have never been built on. People can often buy these lots at a deep discount and then come to us to find the perfect solution for that property. This is also great for realtors because they can bring us along when trying to sell a property. we can throw out a couple of ideas via thumbnails sketches on location. This never fails to perk the interest of a customer who often is not able to visualize a home on the empty lot they are viewing. So, whether you are the end buyer or a realtor… give us a call and we’ll happily swing by any property to help you imagine the possibilities. Want to price out your dream home? 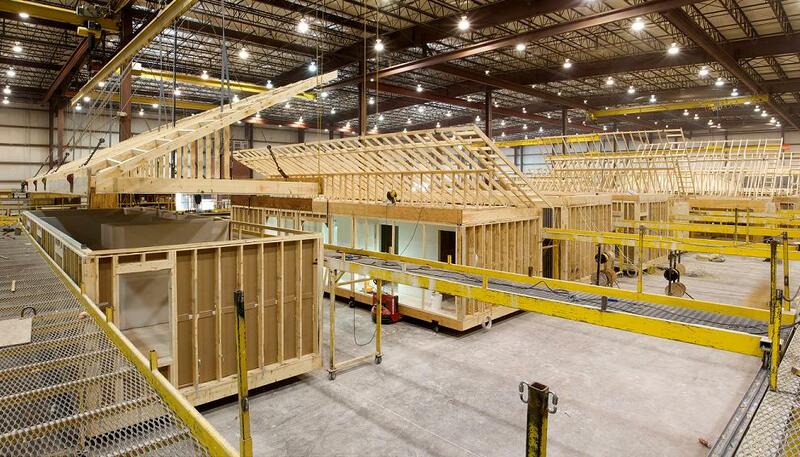 Our new Modular Home Pricing Calculator is now available on all of our model pages!